Use petunias everywhere there is sun. 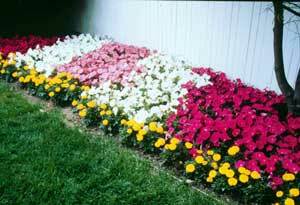 The low growing types are ideal for the front of a flower border, in planters near doorways and pools or on patios. Tuck them in between evergreen shrubs to brighten the area. Use the new ‘Purple Wave’ as a groundcover. Because they tend to attract lovely moths after dark, many homeowners plant them near landscape lighting located near a window or patio where the flowers and their visitors can be enjoyed at night. While all types of petunias are great for hanging baskets, window boxes and planters, the double flowered ones are best used in containers rather than in beds. Their heavy blossoms tend to droop when wet and they can get messy in a bed. 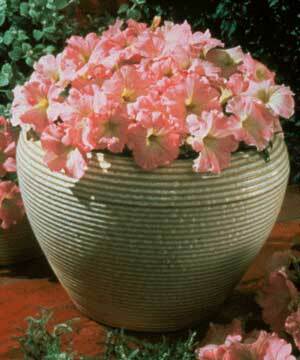 Some petunias are trained to cascade and are ideal for hanging containers. 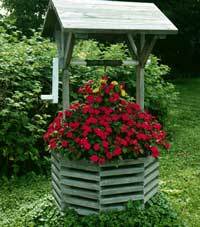 Whatever the type of petunia, plant 3 seedlings per 10 inch basket. Space seedlings about 10 inches apart in a window box or planter. Petunias make a colorful addition to bouquets, although once cut they do not last very long, usually two days. Cut stems with barely opened buds early in the day and immerse the stems in warm water for a few hours. Strip off any leaves that may fall below the water line. Then arrange them in a vase filled with lukewarm water laced with commercial floral preservative or some carbonated, citrus-based soda (non-diet) which will help keep them fresh longer. Brilliantly hued petunias attract hummingbirds if they are in the area. They also support certain butterfly species such as painted lady which like their nectar.